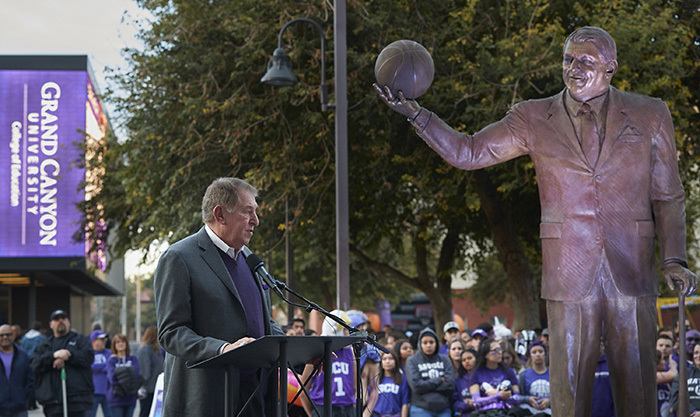 Even as he received one of the biggest honors of his life, Jerry Colangelo was trying to help – and teach – the students at Grand Canyon University. 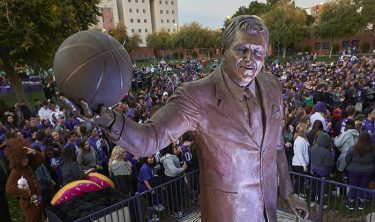 A larger-than-life sculpture with Colangelo’s likeness was unveiled Saturday before the men’s basketball game against New Mexico State. But both during the ceremony and afterward, the man widely considered the most influential in Arizona history was far more concerned with the intention than any extra attention. Mel Shultz and David Eaton, the other two-thirds of Colangelo’s longtime firm, JDM Partners, estimate it was two to three years ago when they first started discussing ways to honor Colangelo’s considerable legacy. They settled on the idea of what wound up being the 9-foot, 4,100-pound sculpture, which officially is from them, their wives (Beth Shultz and Carol Eaton) and their families. 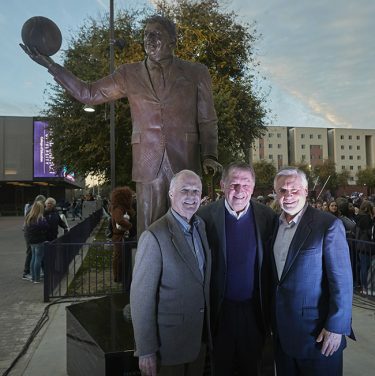 “Our families are honored to be able to present this sculpture as a gift to Grand Canyon University,” Mel Shultz said. The sculptors are Gary Tillery and Omri Amrany of the Chicago-based Fine Art Studio of Rotblatt-Amrany, which has produced approximately 300 pieces, many of them depicting famous athletes such as Michael Jordan and Kareem Abdul-Jabbar. 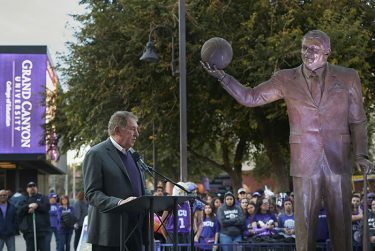 The Colangelo sculpture is particularly meaningful to Tillery because he grew up just a few blocks from GCU, near 27th Avenue and Hazelwood Street, before leaving in 1966 to join the Air Force and eventually moving to suburban Chicago. He was the main sculptor on the project, which took about 18 months to complete. The best part of the undertaking, in Tillery’s mind, was the size of the statue. The reason: It creates more pressure to get it exactly right. “It’s more satisfying to do something bigger than life-size,” he said, adding that if the facial or other details aren’t precise, people will notice more readily than on a smaller piece. Amrany feels the pressure, in every sculpture, of creating an image that is freeze-framed in the minds of people from that era. “The hardest thing is to find the right measure to agree on,” he said. 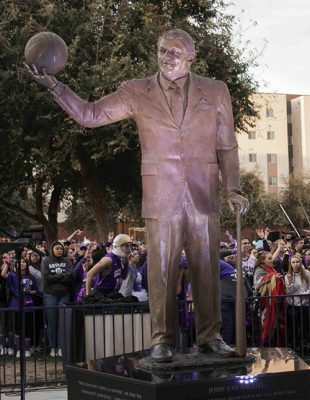 The Colangelo statue has three panels at the bottom. The two other panels feature his most important roles and honors, including Chairman and CEO of the Phoenix Suns and Arizona Diamondbacks, Chairman and Managing Director of USA Basketball, inductee into the Naismith Memorial Basketball Hall of Fame and namesake of GCU’s Colangelo College of Business. It also notes that he presided over the Diamondbacks when they won their only World Series title, in 2001, and when the United States men’s and women’s basketball teams won the last three Olympic gold medals. There also is a line noting that he was voted the NBA’s Executive of the Year four times for his work with the Suns. The sculpture is angled toward GCU Arena and the 16-month-old museum in Colangelo’s honor next door. He hadn’t seen the statue before Saturday. “Pretty good likeness, I think,” he said. With an even better message.